Further to my plans to invest a bit more time into enjoying myself , I decided to kick my good intentions off in style, with a jaunt into Birmingham with my aunt to indulge in High Tea at the fabulous Hotel la Tour this week. If you’ve never been, you’re missing out. Seriously cool, Hotel La Tour is a beautiful retreat a stone’s throw from the shopping hub, decorated in sumptuous fabrics, with a mellow ambience and friendly, professional service. 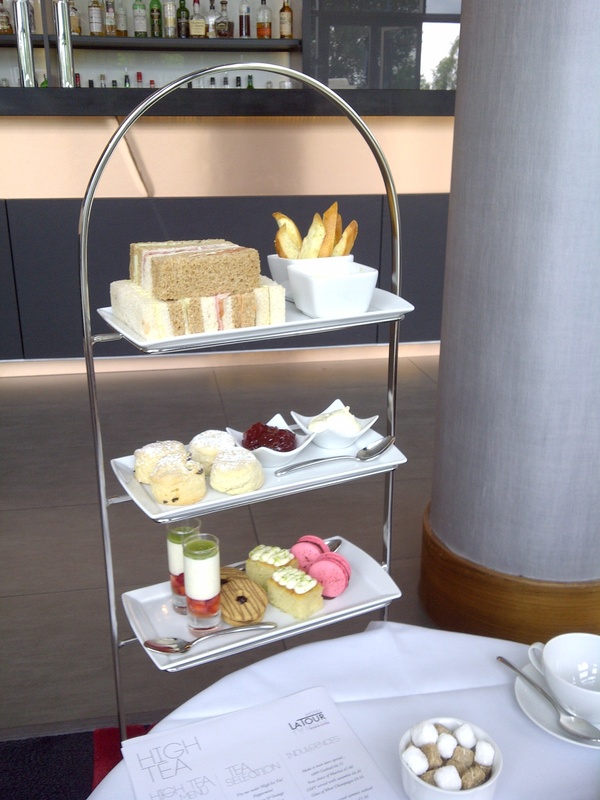 Afternoon tea has become a popular weekend treat for many, but Hotel la Tour’s really is something special. It’s not just the way it’s served – on a three-tier floor-mounted stand, with crisp white cloths and gleaming crockery, but the attention to detail – the delightful home-made delicacies to round off the finger sandwiches and scones and the specially-created exclusive cocktails. 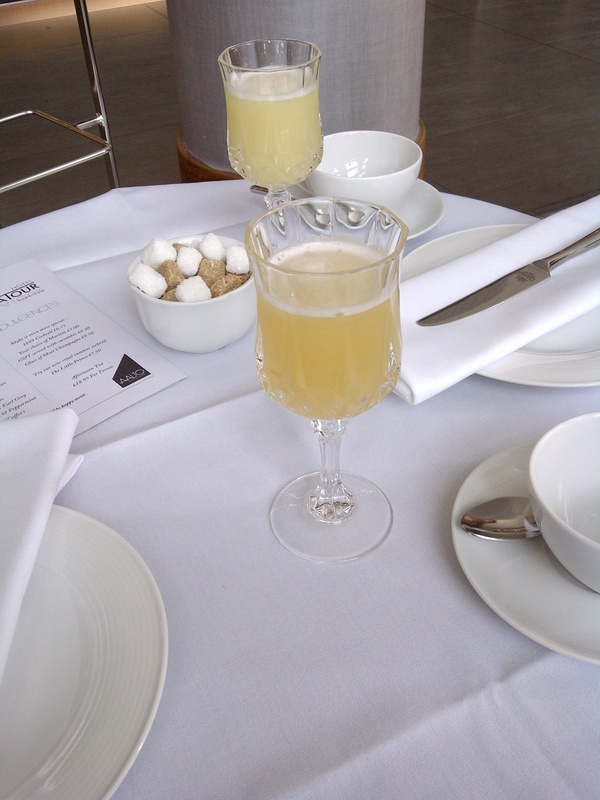 The cocktail of choice for us was created to celebrate the birth of Prince George. Created from passion fruit syrup, gin, vodka and egg white and presented in a crystal glass, The Little Prince is refreshing and light – a perfect choice for a summer afternoon. Plain and fruit scones (at the risk of sounding like Goldilocks, not too big, not too small, but just the right size) served with heaps of thick clotted cream and strawberry jam are a must for any afternoon tea, but the best is yet to come…and requires a bit of an interlude before you can really appreciate them properly. Forget your average French fancies, these over-sized mini desserts are the only way to round off an afternoon. A blackberry jammie dodger, light chocolate biscuit with a thick blackberry jam filling, is HLT’s take on the old teatime favourite , served alongside a shot glass filled with a light and creamy panacotta with summer berries and cucumber, a strawberry macaron filled with a chocolate paste, and a moist lemon sponge with butter icing. Afternoon tea costs £18.95 per person. Hotel La Tour is located in Albert Street – book on 0121 718 8000. Every Sunday, afternoon tea is accompanied by a live music set for additional ambience. A midsummer new year resolution – or: The art of cramming 12 months of good intentions into four. So, we’re in August. That’s seven months between my last post and this one. Impressive. In my defence, it’s all been a bit hectic. At the beginning of year, I pledged to get my life:work balance in order, to adopt a healthier lifestyle both mentally and physcally, and not to sweat the little things. It’s fair to say I have failed on all counts. 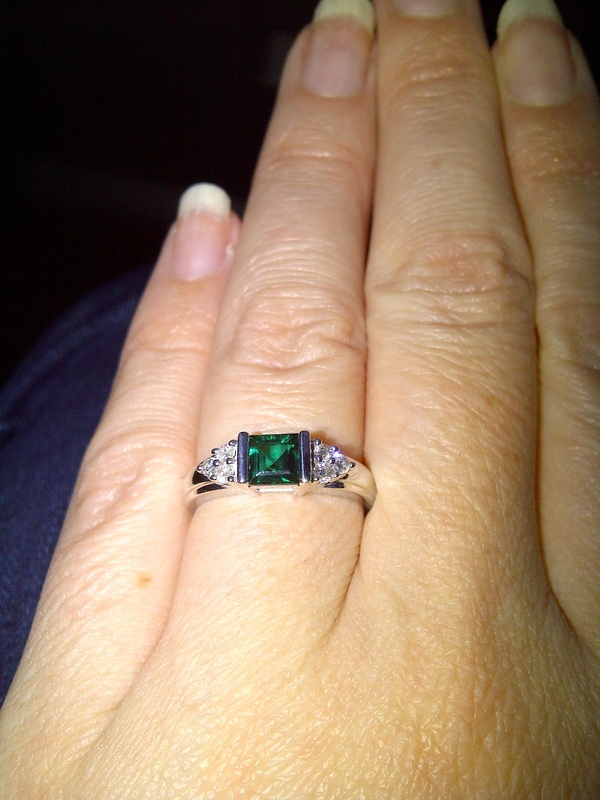 At the end of January, Adam asked me to marry him – I only had one eye open at the time as it was quite early, so I had to get him to repeat it, but one beautiful emerald ring later, I was properly engaged to be married, and a whole new whirlwind began. With just one week to go until my holiday, and not being in the pre-holiday shape and state of mind I ought to be, I think the wind-down needs to commence in earnest… starting from NOW. The usual new year good intentions to shape up sharpish started in earnest yesterday. We hosted Christmas for our whole family in December, as well as a new year Star Wars party, so we’d grossly over-anticipated how much food we’d need. It’s really stuck in my craw how much waste there has been as I’ve thrown away pate, salad, cheese, puddings and cream, and countless other items that have festered in the fridge. It’s bad enough that we spent so much un-necessarily, but the fact that we’ve been so wasteful when there are people starving bothers me more. As such, we’ve still got a freezer full of sliders, mini pies and even mini fish and chip bites just waiting for another gathering, because we certainly won’t be eating it on the new 2013 fitness regime. Last week was too hectic to get things started to my shame, but yesterday saw my first gym session of the year – 40kms completed, 1423 calories burned, and agonising muscle ache to match. 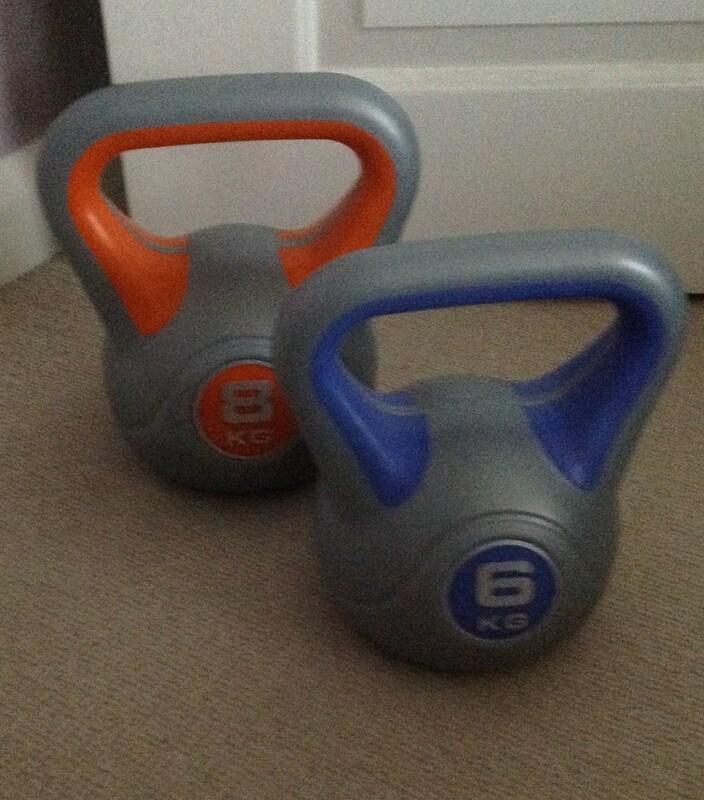 This Christmas I bought kettle bells to try and do more strength work at home, so it’s going to be a case of trying to get into the habit of doing a good stint of ab exercises each day to try and get my physique into shape before I head off on hols next month. My usual failsafe technique to get back into an exercise regime is to treat myself to new workout gear, but in light of heading to the States in a few weeks time, it seems a bit stupid to do that here when I can get some fab gear over there for a fraction of the price. Having battled through as much of the awful Christmas stodge, my body is positively welcoming the prospect of healthier salads, fish and stir fry dishes, and I’m on a mission to cut back on my biggest weakness – Coke. I’m currently drinking huge amounts of water with fresh lemon, but I’m not sure it’ll be sufficient to stave off the caffeine fix for long. Jump starting January – Happy new year! Crazy start to the year – and I’m not complaining.The first January after I set up my own company was the quietest, most worrying month I’ve ever known, and ever since I’ve been worried that the same thing would happen year on year, particularly with the constant doom and gloom press around the state of the economy. I learned a lot of valuable lessons in 2012, wasted a lot of time and energy on projects that were not worth the grief and effort they caused, and gave too many people the benefit of the doubt and allowed myself to be made a fool of too many times – not this year! Mistakes are learning platforms, not something that should become the norm. So 2013 marks a new start for Faith! I’ve made the usual new year promises to myself about my personal life and my business life, but the most important one, for both, is to get my finances in order, and to make sure I started on the right track, I’ve been following Penny Golightly’s Jump Start 2013 to the letter to help me do it – a step by step, easy to follow guide to doing essential admin and organising your life and finances in one fell swoop – within days I’d discovered a policy I’ve been paying for that I don’t need, a standing order to a charity that I forgot I supposedly supported (had been a Christmas gift) and cancelled my monthly subscription to a wine club and my weekly Graze boxes, all of which equates to getting on for £50 a month. GO ME! I spent most of yesterday getting the boyfriend to do the same thing – filing paperwork, checking outgoings, clearing out drawers right through to carrying out a wardrobe cull to give those clothes that no longer fit or that aren’t liked to charity. It’s amazing how much peace of mind the simplest of tasks can give you, but if we can stick to it through January (the hardest part is definitely going to be Tenner Week where we each have to try and live on £10 for the week!) I think it’ll become something we do every six months to keep us on track. I love starting the year feeling so virtuous!